I've seen some surreal films in my time, but this pretty much beats them all. Director Guillermo Del Toro has an impressive track record already, with Cronos, The Devil's Backbone and Hellboy to his name. This time he's excelled himself big-time. 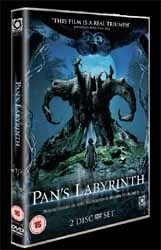 Pan's Labyrinth is plainly a parable for many things, but mainly the coming of age. There are loose connections to Little Red Riding Hood, The Wizard of Oz, any number of Grimm's Tales, and even his own The Devil's Backbone. But this is not one for the little kiddy-winks. It's brutally and graphically violent, and eerie, as well as emotional and fantastical. This is the most weird clash of genres I've ever come across, but the fact that they don't really fit together makes the concept all the more significant. This film spans the gamut of emotions, and is fantasy based in a harsh reality. Only when you reach the end do you begin to change your view of what has just taken place. Ambiguity in an ending is nearly always a good thing. It leaves you thinking. It leaves you thinking you have witnessed something rather special. Extras on this excellent 2-disc set include a commentary by Director Guillermo Del Toro; a National Film Theatre Interview with Del Toro (hosted by Mark Kermode, in my opinion the best film critic around); a prologue by the director; The Power of Myth short, DVD Comic Sketches: The Pale, The Fairies, The Giant Toad and Pan; El Fauno Y Las Hadas; The Colour and the Shape; Storyboard/Thumbnail Comparisons; VFX Plate Compare: Guillermo Del Toro and the Green Fairy; Director's Notebook; The Melody Echoes the Fairy Tale; Mercedes' Lullaby; Poster Gallery & Trailer, and much more. Phew! If you've always shied away from subtitled films before, remove those blinkers, open those eyes, and use this as your starting point. You won't be sorry.